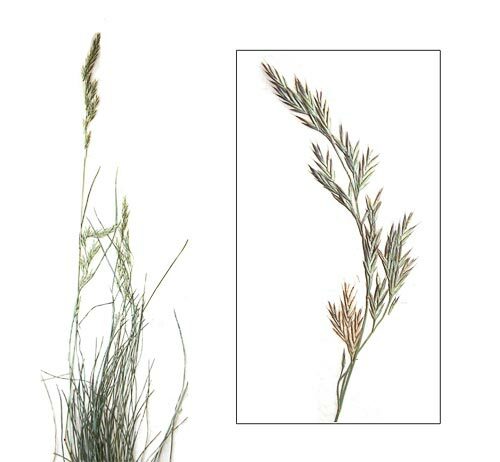 AgroAtlas - Crops - Festuca rubra L. - Red fescue. Family Poaceae Barnhart., genus Festuca L.
2n=14, 28, 42, 56, 64, 70. Perennial plant, small size, hairless, cespitous or rhizomatous. Stems erect, 60 - 80 cm high. Needle blade when young. Blade long, narrow, in needle at least on the bottom leaves. Blade flat, very veined on the upper leaves. Blade dark green. Ligule very short. Auricles reduced to minute excrescence. Panicle-like inflorescence, spreading, often reddish. Spikelets with 4-8 aristate flowers, 7-12 mm long. Upper glume pointed, lemma ciliate or aristate. Blossoms in June, seed maturity can be expected during July. The weight of 1000 seeds is 1,0 to 1,3 g (average seeds). Cross-pollinated by wind. Introduced into culture since the end of XVIII century. Cultivated on small squares in the forest, steppe and mountain areas at 21 regions and republics of former USSR countries. 4 breeding cultivars for forage purposes have the state permission for utilization, and also 41 - for lawn?s establishment. Mesoxerophyte. Large climate range. Very resistant to cold and heat. This grass is able to withstand ponding for up to two months, and is tolerant of waterlogged soils. Resistant to late spring frosts and to early autumn frosts. Very resistant to drought. Can be an interesting alternative to perennial ryegrass in grazed pastures in dry continental climates or on dry sands. Optimum on cool to dry soils. Marked preference for slightly dry soils, well drained (sand or shallow soils). Large range for nutrient availability. Can be abundant on soils moderately supplied to very rich in nutrients and on moderately acid to alkaline soils (mesotrophic to eutrophic species). Has however quite low requirements, can survive on rather poor soils. Preference for light, sandy soils but large range. Valuable component of grasses mixtures (as25% of the mixtures) for cultural long-lived pastures. Tall forms are used for artificial haylands (as 40% in mixtures with timothy and alsike clover). Regrows in the end of April and that.s why it is good for grazing in the first part of May or for early harvest. Good regrowth after 3-4 grazings. Good palatability. Used for hay, haylage, silage. Improves soil?s structure and fertilization. Forage yield is approximately 24,0-27,0 MT/ha; dry matter yield is 6,5-7,5 MT/ha; average seed yield is 100-200 kg/ha. Used as a lawn grass, too.